At Akeley Wood School we aim to ensure that every student has the opportunity to look beyond our own immediate school environment, engage with our local community and demonstrate care and thought towards others. At this important time of year as we approach Christmas we have an exciting opportunity for our students to help those less fortunate than ourselves. 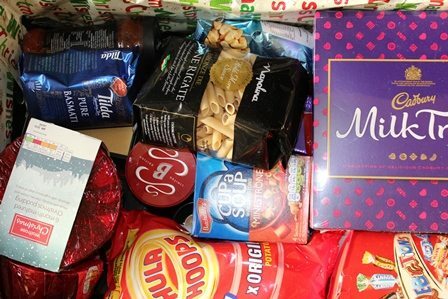 Working closely with MK Food Bank, we would like students to work together as Tutor Groups to prepare a Christmas Hamper for single or elderly people and families in our locality. The generous gifts of food and presents we provide are greatly appreciated, at a time when people are particularly in need. Each form group will be asked to make a Christmas Hamper. This entails providing food and presents for adults and children alike. More detail will follow depending on the specifications of each hamper but items should be non-perishable and could include the following, for example: Small wrapped gift for a child under 16, Christmas cake, Christmas pudding, custard or brandy sauce, Christmas novelty crackers, crisps, biscuits, tinned meat, stuffing, gravy or Oxo cubes, sweets, chocolate, tea, coffee, sugar, drinks (fizzy or long life), long life milk, part baked bread or a prepaid voucher for fresh meat & groceries. Collection of Christmas Hampers will be on Friday 8th December and the School will then deliver the hampers to the appropriate centres. We look forward to receiving your generous gifts for people in need and thank you once again for supporting this valuable appeal.